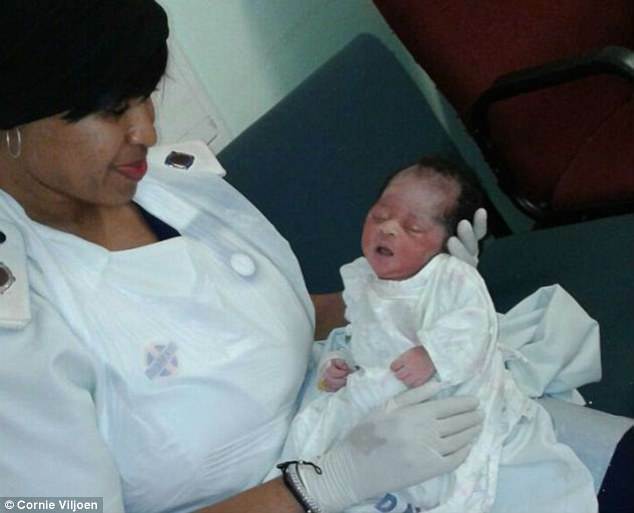 Miracle baby was rescued ALIVE after being dumped in a storm drain in South Africa The baby was left in the drain in Port Elizabeth, South Africa. Charmaine Keevy, 63, was out for an early morning walk when she made the find Police said the baby could The newborn baby was suffering hypothermia and respiratory problems The Newborn was abandoned naked six feet underground in a freezing storm water drain in the middle of stinging red ants. Charmaine Keevy, 63, was out for an early morning walk with her dog in Port Elizabeth, South Africa, when it suddenly started barking loudly at a drain duct in the gutter.She got on her hands and knees heared a baby crying from inside the drain. Charmaine began stopped a car passing by as Cornie Viljoen, 60, pulled over. Cornie grabbed a steel bar from the boot of his car and managed to move the heavy concrete slab covering the storm water drain free. Cornie went six feet down into the drain and was stung by the ants but was able to grab the baby. The police and an ambulance arrived quickly and paramedics treated the baby at the scene for hypothermia and she was rushed to the Dora Nginza Hospital. The Provincial Health Spokeswoman Sizwe Kupelo said the newly born was found naked with the umbilical cord still attached. Charmaine who found the baby on her morning walk explained:'I honestly believe I was meant to find that baby by God as I usually take a different route on my dog walk but for some reason went another way. 'I cannot help but feel that there is some sort of a plan and a purpose for that little girls' life – it is a miracle without a doubt. The hospital staff in Port Elizabeth named her Grace April. The baby weighed in at 3.09kg and the police are trying to locate the mother. It was estimated she had been lying abandoned for a couple of hours and was near to hypothermia. Oh my! Thanks be to God for taking that lady and her dog to find this little girl. When God has a plan for someone, there is nothing, no one, in this world, or any other world, that can stop that plan from happening. 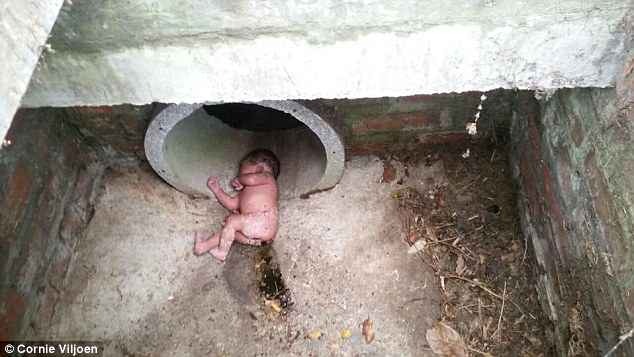 This poor little baby, God's creation, was dumped without mercy, into the cold water drain, left to die. But God's merciful hands guided that lady to this little baby, and both that lady and the man that stopped his car, both rescued her, guided by God's merciful and powerful holy Hands. Praise be to God, thanks be to God, Father Almighty!! Thank you dear Lord!! !